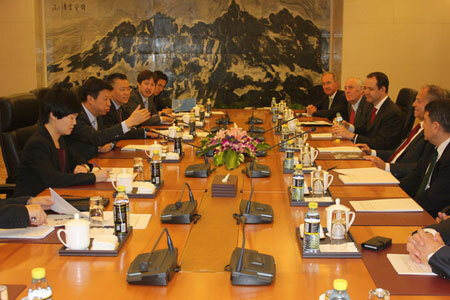 On July 11, 2013, Vice Foreign Minister Song Tao met with Chairman Stephen Perry of The 48 Group Club of UK and his delegation. Song expressed appreciation for the 48 Group Club for its long-term important contributions to the development of China-UK relations. He hopes that the 48 Group Club will continue to carry forward the good tradition and push for long-term healthy and stable development of China-UK relations based on mutual respect and mutual accommodation of each other's major concerns. Perry and his delegation members noted that the 48 Group Club will continue to be committed to helping the outside world to gain in-depth understanding of China and advance bilateral cooperation in the fields of finance, services, environmental protection and Chinese businesses going global, to continuously strengthen UK-China friendly cooperative relations.